Ji-li Jiang came to the United States in 1984. She worked at various jobs, until she started her own company, East West Exchange, in 1992. Her company promotes cultural exchange between Western countries and China. 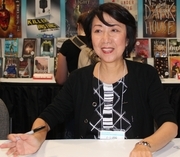 She is the author of two books: her memoir, Red Scarf Girl; and The Magical Monkey King, a retelling of traditional Chinese tales. Ji-li Jiang is currently considered a "single author." If one or more works are by a distinct, homonymous authors, go ahead and split the author. Ji-li Jiang is composed of 3 names. You can examine and separate out names.